Today is Boxing Day, but since we don't celebrate it in the US, I thought it would be a good day to take the time to express some gratitude. First, thank you to everyone again for your kind words about the loss of my cousin's son in the Newtown shooting. It is a great loss to everyone who knew him and we are all still in a state of stunned disbelief. We all agree, however, that the kindness of friends and strangers means so much, not just to my cousin's family, but to all the families. People are truly amazing and generous. 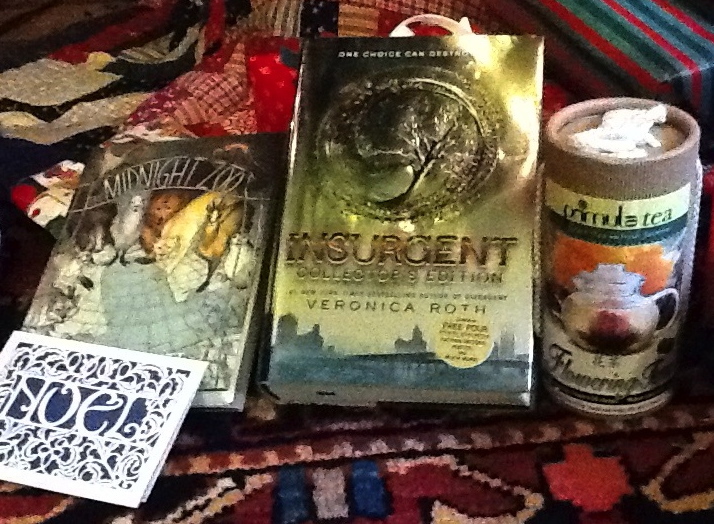 Second, thank you to everyone at The Broke and the Bookish for hosting their Secret Santa Exchange again this year. It was great fun participating and I hope everyone enjoyed it as much as I did. My Secret Santa was Wendy at Literary Feline - Musings of a Bookish Kitty. She kindly sent me Midnight Zoo by Sonya Hartnett, which I have wanted to read for a long time, and Insurgent by Veronica Roth, which I can't wait to read now that I have finished Divergent. And a really lovely container of 12 different Flowering Teas. Tea is my go-to drink of choice, especially while I am reading on a cold winter's day. And thank you to the blogging community for helping to make so much fun. Not only did we have BEA in New York City this year, but there was also the really successful KidLitCon organized and hosted by Betsy Bird at A Fuse #8 Production, Liz Burns at A Chair, A Fireplace & A Tea Cozy (whose blogs are int the process of migrating to an improved SLJ server) and Monica Edinger at Educating Alice. It was great to see old friends and make new ones this year. I would also like to thank my followers for, well, following and commenting. You are a very valued part of blogging and make it all worthwhile. Last but not least, thanks to the people who hosted the memes I participated in as well as the reading challenges. And I am looking forward to another great blogging year in 2013, thanks to everyone who has touched my life this year. I am, understandably, a little behind in my reading but will be spending some time this week catching up, so new posts are definitely on their way. I hope everyone has had Happy Holidays and wish you all A Happy New Year! I love the idea of celebrating Boxing Day. I might have to start my own tradition with the grands. I hope you have a lovely ending to 2012. Your blog is a gift to my reading and writing life. Thanks, Joyce, you have been a big support to me as well. I liked the idea of using Boxing Day as a time to say thank you to everyone, so I decided to do it here, too. It seemed like a good way to end the year and start a new one. I hope you have a Very Happy and Productive New Year! My heart breaks for your cousin's family. Thank you so much for stopping by and commenting on my posts. It makes me smile every time I see that you've stopped by. Have a blessed New Year. Thanks, Angela. This has been v very difficult time, as you can imagine. I really do enjoy your blog very much, and I hope you also have a very Happy New Year. I am glad I got the opportunity to "meet" you through the Secret Santa Exchange, Alex. I hope you enjoy the books and tea! I am so sorry for your cousin's family. My heart and thoughts are with them--and with you.